There is just a trio of orchestras in the greater Washington, D.C. region that have a ready reputation (and physical placement) for being the "default" purveyors of symphonic and operatic music: at the Kennedy Center, we have the National Symphony Orchestra and the Opera House Orchestra; at the Music Center at Strathmore, we get visits via I-95 from Baltimore Symphony Orchestra. All of these orchestras are top-rate, and we are lucky to have them, grumblings aside. But in the surrounding communities, there is room for more than just those house orchestras: more neglected repertoire to be played, more talented conservatory graduates not employed by the big three, and more venues to fill with music. 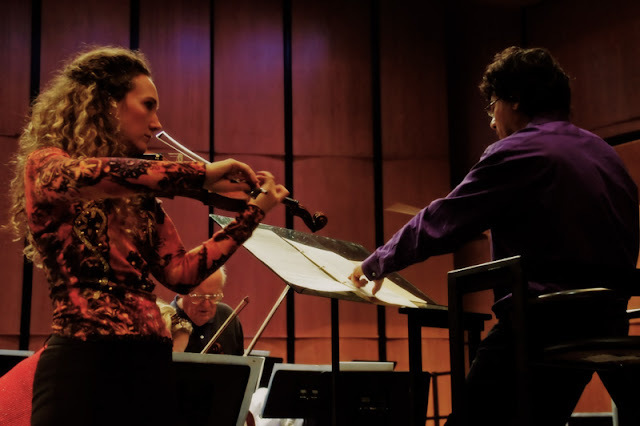 Among such suburban symphonic ensembles, the Alexandria Symphony Orchestra stands apart, and can come as a surprise to anyone who never bothered crossing the Potomac River (or city limits, for that matter) to give them a try. This Saturday evening is as good a time as any. They perform at 8:00 p.m. in the Rachel M. Schlesinger Concert Hall, which is right off I-395 near King Street. The highlight of the program (to these ears) is Samuel Barber's lush Violin Concerto. This year we are celebrating the centenary of this American composer's birth, and as recently as last Thursday, one of Barber's most important advocates Thomas Hampson gave a thrilling recital of the composer's art songs at the Library of Congress' Coolidge Auditorium (preceded by a lecture from authoritative Barber scholar Barbara Heyman ), and the Library bestowed its rare Living Legend award at the concert, in tribute to Mr. Hampson's tireless efforts to preserve the American art song, including the legacy of Samuel Barber, through his Hampsong Foundation. The Alexandria Symphony Orchestra has programmed surely the most often-performed and beloved works from Barber's opus (excepting his overplayed Adagio for Strings that fails, for all its melancholy brilliance, to represent Barber's idiomatic balance of classically-rooted tonality and modernist chromaticism). Performing as soloist is the amazing local virtuoso Jenny Oaks Baker. I had the privilege to film the rehearsal of this work last night, and from what I heard, Maestro Kim Allen Kluge has really gotten it together: the orchestra is in fine form, and Mrs. Baker performs the work with expert nuance and confidence. And of course, the music itself soars. To say that Barber's Violin Concerto is the greatest of its genre that any American composer yet has produced is a view widely held, and not at all preposterous. Mrs. Baker flatters the score among the ranks of famous readings from Nadja Salerno-Sonnenberg, Joshua Bell, Gil Shaham and (my favorite, dating from my mid-'90s crush) Anne Akiko Meyers. Don't miss it. Rounding out the program is more Americana from Aaron Copland, including excerpts from his Appalachian Spring, and the close relative of variations on its famous Shaker tune by film composer Sam Cardon. You can purchase tickets online or call the box office at (703) 548-0885.